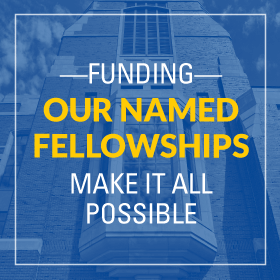 The Ford School is deeply committed to policy engagement, putting its strengths and relationships to work to catalyze real and lasting change in the world. The University of Michigan, founded in 1817 as one of the nation’s first public universities, has practiced engaged public service as a core aspect of its mission for nearly two centuries. This tradition is nowhere stronger than here at the Gerald R. Ford School of Public Policy. To successfully tackle today’s critical policy challenges requires us to be engaged in the real world. Across all of our activities, we are deeply integrated with a wide range of policy communities. Our faculty bring their expertise to bear off campus by serving in, consulting for and advising international, national, state, regional, and local government organizations; serving non-profits and community organizations; writing op-eds for major news sources; providing commentary to local, national and international media sources to help inform policy debates; testifying before Congress, and much more. Our students learn directly from leading policymakers and practitioners who bring their expertise into the Ford School, providing guest lectures, seminars, and more. 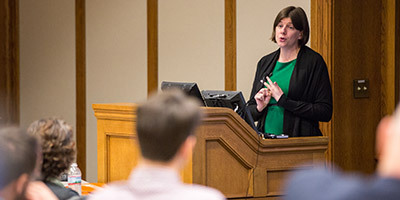 The Ford School’s Applied Policy Seminar for master’s students embeds teams of students in public sector client organizations, to study and address significant challenges at the local, state, national and global levels. Our International Economic Development Program takes a group of students each year on a spring trip to destinations across the globe, for a week of direct study and hands-on work on policy issues in foreign contexts, meeting with local, regional and national officials and making recommendations for policy solutions on a range of topics. Our annual Integrated Policy Exercise similarly links students with leading policymakers dealing with today’s most pressing issues in an intense week-long policy simulation covering topics such as immigration policy, U.S.-Mexico border policy, health care reform, regional transportation, Great Lakes water management, and much more. 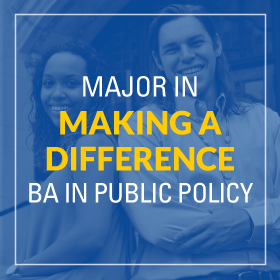 And another key engagement strategy at the Ford School focuses on summer internships for all master’s students, who are placed in a wide range of public organizations to enhance their classroom experiences and gain hands-on experience working in the policy world. 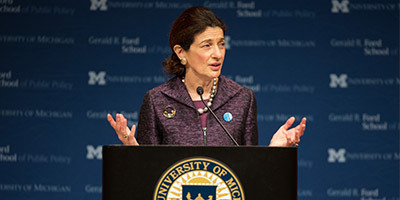 Senator Olympia Snowe visited the Ford School on 9/19/2013. Policy Talks @ the Ford School: The Ford School makes Ann Arbor a destination for distinguished policymakers from around the world. These leaders give public lectures and meet with small groups of students to discuss substantive policy issues or offer career advice. Dozens of speakers visit the school each year, including 2014 speakers like Paul Rusesabagina, the hotel manager who inspired Hotel Rwanda; U.S. Senator Olympia Snowe (R-ME); Carrie Hessler-Radelet, director of the U.S. Peace Corps; and U.S. Senator Carl Levin (D-MI). The Towsley Foundation Policymaker in Residence Program brings individuals with significant national and international policymaking experience to campus to interact with students and faculty. Policymakers in Residence teach graduate-level courses ranging in length from six weeks to a full semester, deliver public lectures, and advise and mentor students on projects, papers, and career plans. Professor Joy Rohde gave a Book Talk for her first publication "Armed with Expertise" on 4/14/14. 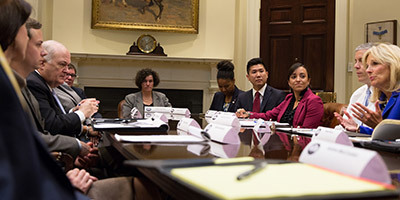 Our research centers and our faculty members undertake applied policy research on a wide range of topics, working directly with public officials at all levels to help solve vexing problems. Examples include the Education Policy Initiative, which is working with school leaders across Michigan and other states to improve public education, and the Michigan Public Policy Survey, which partners with the state’s associations for county, city, village and township governments to improve our understanding of state and local governance. Faculty researchers address urgent policy problems in a wide range of domains from poverty, to health care, climate change, energy, labor markets, immigration, and much more. In a December 13th Detroit Free Press op-ed, “Where will public goods stand in Trump’s administration?”, Marina v.N. Whitman considers the importance of public goods to President-elect Trump’s administration. The Youth Policy Lab has issued a request for proposals to organizations seeking to use data to improve service delivery or program design for Michigan youth. Applications for the Michigan Technical Assistance Partnership (M-TAP) Program are due March 1, 2017.